MINNEAPOLIS (AP) — With the Hawks‘ momentum gone and a noisy sellout crowd cheering the Timberwolves, first-year Atlanta coach Lloyd Pierce made a bold prediction. “I told our guys at the end of the third quarter, ‘This is going to be our best win of the season,'” Pierce said. It certainly wasn’t their prettiest with 24 turnovers, but the Hawks made just enough hustle plays to overcome blowing a 22-point lead and beat Minnesota 123-120 in overtime Friday night. 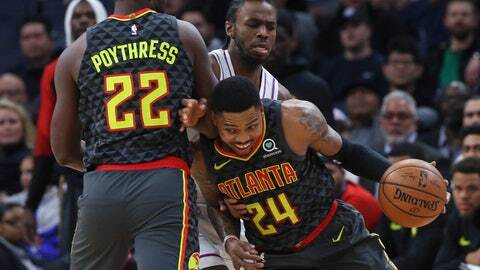 Kent Bazemore scored 23 points and John Collins added 21 to back up Pierce’s boast. Bazemore sent it to overtime with a fast-break layup after stealing an inbounds pass with 20 seconds left to play. Justin Anderson blocked Derrick Rose’s buzzer-beater attempt as time expired. Wiggins, a career 74 percent free-throw shooter, was Minnesota’s biggest offender from the stripe. He went 5 of 12 and heard frustrated boos from the home crowd. “That’s fans for you. We’ve got some (expletive) fans and we’ve got some good fans. That’s just how it works,” he said. Lynx star Rebekkah Brunson will be part of the Timberwolves’ broadcast team this season. She’ll do 10 upcoming games either as a second analyst during the game or work on the pregame show. Brunson’s in-game debut will be on Jan. 2 when Minnesota visits Boston. Former Lynx player Lindsay Whalen did eight broadcasts last season. Hawks: Bazemore has scored 20 points in five of his last eight games. … Alex Poythress scored 12 points in his third game since being called up from the G League. All of his points came in the first quarter. … It was only the second time this season Atlanta has held a 20-point lead; the Hawks won the first game on Oct. 21 at Cleveland. Timberwolves: Rookie Keita Bates-Diop was active for the game for the first time since being recalled Dec. 22 from Iowa of the G League. “He’ll be back with us for a while now, and then when we have another opportunity to send him down we will. But he’s coming along very nicely,” coach Tom Thibodeau said.